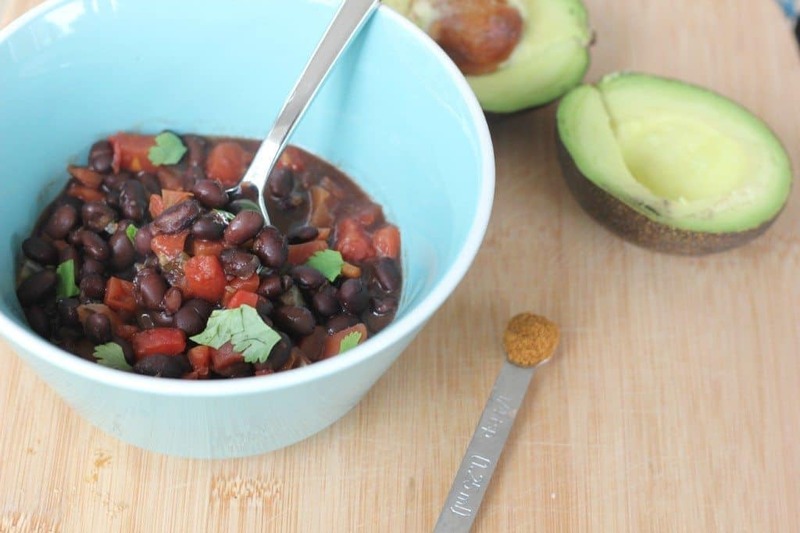 This vegan and gluten free black bean soup recipe is only 5 ingredients. You can have it ready on the table in just 15 minutes! I love black bean soup. It’s hearty, filling, and deliciously spicy. This recipe uses a little shortcut: salsa. By using a jar of your favorite tomato salsa, you’re adding extra vegetables and tons of flavor with minimal effort. I personally love using Green Mountain Gringo’s medium salsa in this recipe. I’ve also tried it with salsa from Trader Joe’s and the Kroger store brand and they’ve all turned out great! If you like things on the spicier side, use a medium salsa but if you’re not sure what spice level you want, stick to mild. You can always add a little more chili powder if you need extra spice! This recipe can also be customized with your favorite toppings. I usually keep things vegan and add a little avocado on top but if you’re cooking for others who might have different tastes, you can easily add cheese and sour cream on top. 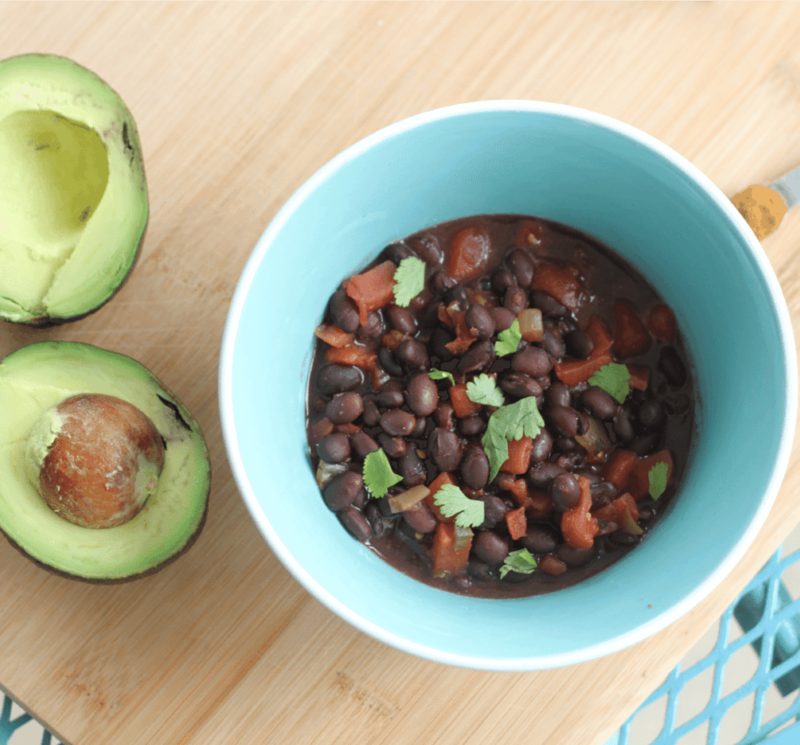 This black bean soup is just 5 ingredients and can be ready to serve in 15 minutes! Optional toppings: fresh cilantro, avocado, etc. In a large pot, add in your black beans, including the liquid in the can. Add the tomatoes and salsa, cumin, and chili powder. Cook over low heat for 10-15 minutes, then remove from heat and let cool slightly before serving. When ready to serve, top with sliced avocado or a sprinkle of fresh cilantro, if you’re using additional toppings! I recommend buying low sodium or no salt added black beans. 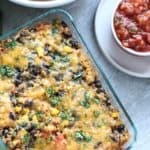 Since this recipe uses the liquid in the can, the sodium can add up quickly if you’re using regular canned black beans. 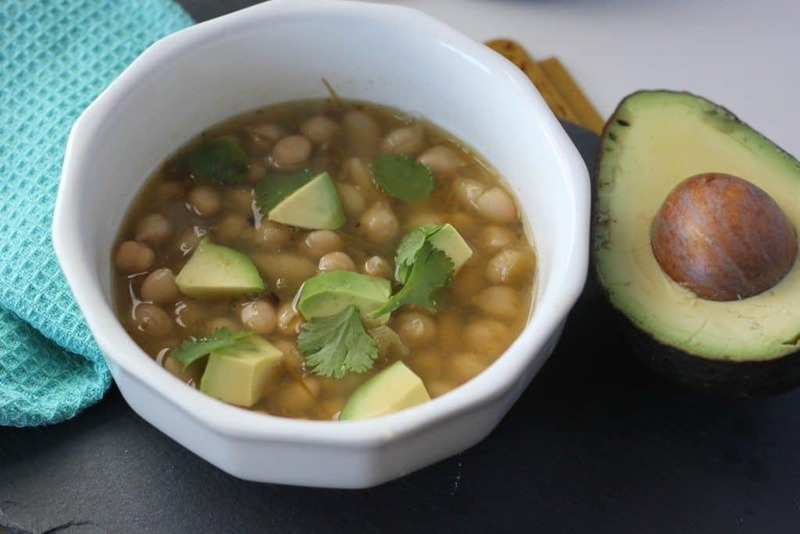 We usually top black bean soup with some avocado slices and fresh cilantro, but this soup has plenty of flavor on its own! It reheats well, so you can easily make a double batch and pack it for lunch during the week. I’d also like to point out that a serving of this contains 22g of plant-based protein for less than 400 calories. Not bad for a vegan soup, am I right? I have a feeling I’ll be making this recipe a lot this year. 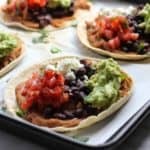 I always have black beans and salsa in the pantry! If you’re looking for other quick and simple soup recipes, try this spicy chickpea chili. It uses the same salsa hack, but with salsa verde, so it has a totally different flavor. What’s your favorite super quick dinner? This post was originally published November 2015. Updated March 2018. Beyond easy and quick!! Love it! Looks so simple yet delicious and filling! 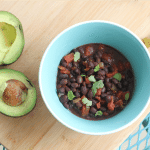 I have been looking for a black bean soup recipe – this looks really good! Yum! I’ve been on a big soup kick lately. It’s so comforting as the weather gets cold, but I always make way too much and get stuck eating the leftovers by myself since Riley doesn’t always like leftovers. I’ve been in a black bean mood as well as soup. I feel like this is perfect. Oh gosh, black bean soup is one of my favorites! I like to puree mine and add a dollop of plain greek yogurt along with avocado. Delicious!! You are the queen of simple and easy meals! This looks delicious. Your house projects sound like so much fun too! I hope you’ll give us an update when everything is done. I need to live vicariously through you because we aren’t going to buy a home for at least another year, waaah! This is my first time on your site and boy am I DROOLING this looks so good! Just saved it to Pinterest to remind me next time I go grocery shopping to get some supplies. Thank you so much for sharing! Definitely don’t keep the quick and easy recipes to yourself! Thanks for stopping by! Quick & easy recipes are definitely my favorite, so I’ll keep on sharing! Simple and satisfying soup Liz! Love easy and black beans!!! I’ve never not drained my beans before using them. I hate the waste so love the idea of throwing everything in and having this ready in no time! I always forget how quick and easy soups can be. This looks perfect for football Sunday! My fave quick dinner is butternut squash in the Vitamix! It comes together ridiculously fast… I love it! This looks delish! I’m always trying to find ways to incorporate more beans into my diet. Love this semi-homemade soup on a cold night, after a full day of work. I might add in cooked rice and maybe even a bit of my basic vegetable broth:) Perfect for tonight. Oh yes!! How I adore black bean soup. And my college boy has just discovered it as well. This has fraternity cooking all over it! Great recipe! Love the simplicity and full flavor! This soup looks wonderful! It is actually snow No more here today, so this looks like the perfect lunch for me & my kids to enjoy and stay warm! You had me at “quick and easy”! I love the simple recipes that are delicious and loved by all and this looks like just that! Thanks for sharing! This soup looks fabulous. I much prefer a chunky version to a creamed black bean soup. Perfect way to stay full and keep healthy. Oh wow! I love how easily this comes together. So perfect for a windy day like today. Congrats on your cookbook! This soup looks so tasty and comforting! I haven’t had black bean soup in so long and this looks so good. It has definitely peaked my interest. Yum, this looks so comforting on this rainy day! And, congrats on your cookbook!